Libertarian ophthalmologist and Kentucky Senator Rand Paul has decried the health care hellscape of Canada’s single-payer system throughout his career. 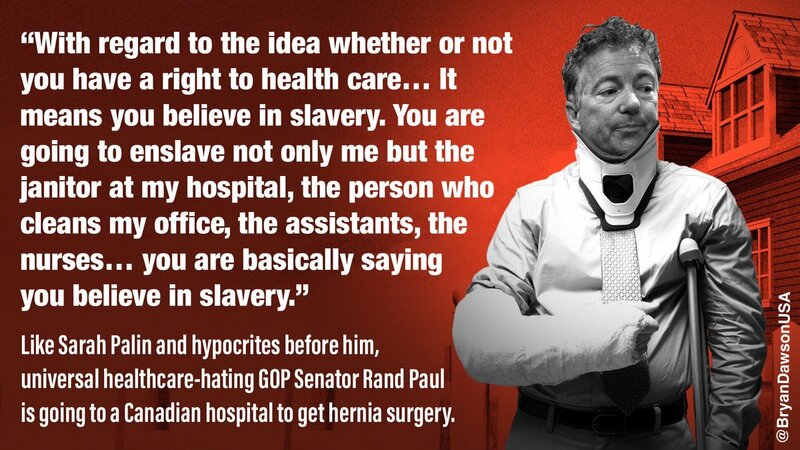 In fact, he calls it “slavery.” So it is ironic and totally in line with his everyday hypocrisy that we learn Sen. Paul has scheduled major surgery in Canada. According to the Louisville Courier-Journal, the procedure will repair a lingering injury from the brutal 2017 attack by his neighbor, Rene Boucher, over a long-running dispute about Sen. Paul’s landscaping habits. As you might expect, the senator is spinning his Canadian health care as totally different from regular Canadian health care. Kelsey Cooper, a spokeswoman for Paul, said the hospital is privately owned and people come from around the globe for their services.“This is more fake news on a story that has been terribly reported from day one — this is a private, world renowned hospital separate from any system and people come from around the world to pay cash for their services,” Cooper said in an email to the Courier Journal. WAIT WAIT STOP THE PRESSES what do you mean there are private hospitals in Canada?! What the heck kind of socialist country is Justin Trudeau running here? Why, next you’ll be telling me that the wily Canucks have a thriving private insurance market! How does this circle square? Take note: health care is an emerging sector of the global economy, and the anti-globalist Rand Paul is enthusiastically leaning in. Maybe the Canadians will start to worry about Americans coming to steal their less-expensive, because socialized, medicine. Maybe they should build a wall to keep us out? I mean, heaven only knows what kinds of diseases we might bring.